A notice has been posted at the Beyond Baroque Web site that says the arts organization has finally completed negotiations (make that nearly 10 full months of negotiations) and signed a dollar-a-year, quarter-century lease with the City of Los Angeles for its home in Venice Beach. 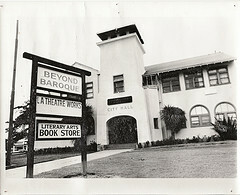 "On Monday Dec. 22, 2008, Beyond Baroque signed a lease with the city assuring its home at 681 Venice Blvd for the next 25 years. We are grateful to the City, 11th District Councilman Bill Rosendahl and his staff, and to all the many, many people who helped make this historic day possible. -- Fred Dewey." You might recall that the Los Angeles City Council gave the deal its blessing way back in late February. Previous blog post: Robert Graham in L.A.